Twas the night of Desert Christian Elementary School’s annual Christmas program in Lancaster, California. Eight-year-old Raymond “Ray Ray” Carver Davison III had usually been the voice of the annual solo performances. This particular year, however, would be different. Months before the show, Ray Ray’s teacher pulled him aside and told him that they were going to let another student have a chance at the solo. This was disappointing news for Raymond. Of all the songs he had sung in previous years, he wanted to sing “Go Tell It on the Mountain” the most. Although he was not going to sing the solo, Raymond kept practicing the song. Just about every day in the Davison household in the several months leading up to the performance, Raymond was telling it on the mountain, over the hill and everywhere that Jesus Christ was born. On the night of the program, Cheryl received a phone call that would make all of Ray Ray’s efforts throughout the past months worthwhile. “So as it turned out, the little girl that got chosen to sing that song got a fever and got really sick. And the teacher called me at the last minute the night of the program like, ‘Oh my God. Can Raymond sing this song because the little girl, she’s sick. She can’t do it,’ ” Cheryl recalls. And disaster was averted. Prepared for this unexpected opportunity, Ray Ray sang just like he had been practicing all semester and sent the audience off on a high note entering winter break. Similar to the Christmas performance all those years ago, Raymond now finds himself in another role where he’s asked to step in to fulfill a vacated job. With the Bears losing nearly all of their starting linebackers last year, including former captain and middle linebacker Hardy Nickerson, the team had to find somebody to conduct the defense. And the coaches called on No. 31 to take the helm at middle linebacker. The players also recognized Raymond as their guy for 2016 and voted him as a defensive captain. At a time when the Bears needed somebody to enter the next level and lead the team, Raymond again answered the call, like he had done for the Christmas performance more than a decade ago. 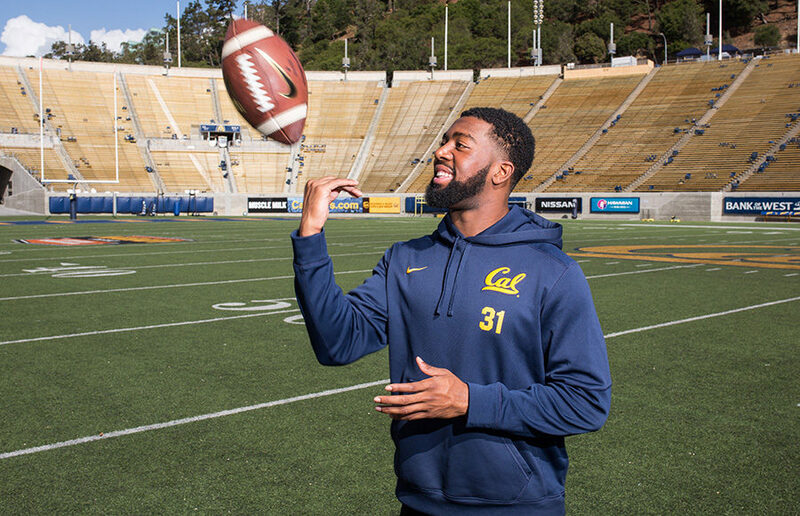 Raymond came into Cal as a defensive lineman in 2013. But because he was on the lighter side as far as defensive linemen go, the coaching staff moved him to linebacker in the spring of his freshman year. But all the movement within different parts of the defense has prepared him to be a successful linebacker. His 27 solo tackles currently lead the team and rank second in the Pac-12. Raymond credits his experience in the trenches for giving him extra perspective and knowledge that help him succeed as the shot-caller of the defense. With a background of the workings of the defensive line, Raymond can analyze and position his teammates accordingly before the snap to maximize his defense’s effectiveness. While the preparation and positioning are there, consistency in execution is still a work in progress. At times, the defense is dominant, making plays to help the Bears win. But there are moments when the defense struggles and plays off beat. Raymond grew up in Southern California in Palmdale. From the beginning, Raymond has always been singing. He did performances such as his Christmas solo often. Serving in his church’s praise team and participating in various plays and school events, he was no stranger to the stage. In addition to singing, Raymond also played the violin and basketball. Growing up, Raymond saw basketball as the sport he wanted to compete in for the majority of his life. But when he went to Crespi Carmelite High School in Encino, California, he felt there was more opportunity in football, and he rode that wave to where he is right now at Cal. Initially, Raymond had wanted to go to Northwestern, drawn by the academics it offered. Although he was excited to be a Wildcat, what he really wanted was to be in California playing football. “When (Cal) called me that it had an offer for me to play football, it was a no-brainer,” Raymond says. Now, Raymond is set to graduate with a legal studies major and a music minor. Entering college, he had not planned to pursue music, but after he saw that there was an opportunity to grow as a musician at UC Berkeley, Raymond decided to add his passion to his already considerable workload. But no matter where Raymond is, singing has always provided him a remedy from the stresses of his schedule. “It’s just something that makes me happy and allows me to live life happily,” Raymond says. He intends to apply to law school after football, whenever that may be, and explore careers in which he can mix law with his passions in music and sports. In addition to singing and football, Raymond enjoys fishing and solving Rubik’s Cubes. His average time is currently about a minute and 30 seconds. When Cal plays on the road, the game is usually on a Saturday night. As soon as the contest ends and the post-game conference is finished, the players need to go back to Berkeley, as they have a whole list of things to do Sunday. They don’t get to stay another night and take their time to enjoy their visit to another school. If a game starts at 7:30 p.m. on Saturday, it will likely end around midnight. The journey back home after the game includes a bus ride to the team plane, a flight and a bus ride to Memorial Stadium. Then the players are finally free to go home on their own. It’s probably 3 a.m. or 4 a.m. by this point. Service at the Church of Christ on Macdonald Avenue in Richmond begins at 11 a.m.; members of the praise team meet at 10 a.m. for worship practice. Despite the short night of sleep after playing 75-plus defensive snaps just 12 hours ago, Raymond is right on time. Although he had sung at his home church in Reseda Church of Christ, Raymond did not immediately join the worship team when he came up to Berkeley. The Church of Christ is a larger congregation that is made up of several churches in different locations around California. So when Raymond moved to the Bay Area for college, it made sense for him to attend the Church of Christ on Macdonald Avenue. And when Dromgoole visited Southern California a couple years ago, it also made sense for him to visit Reseda. But, he did not expect to see Raymond up on stage performing. Raymond III is named after his father and his grandfather. The nickname “Ray Ray” comes from his parents and has always been the name he’s more commonly referred as. His middle name “Carver” comes from his mother Cheryl’s grandmother, Mary B. Morris-Henderson. When she attended Tuskegee University, her professor was George Washington Carver, the famous inventor. And she named her son, who would go on to be Cheryl’s father, Carver. Raymond Carver Davison III’s name represents many generations of history and legacy in his family. Like a crescendo that builds up to a fortissimo, Raymond’s impact on the circles around him gets louder and more noticeable every day. Whether he’s singing on stage or making plays on the field, Raymond is not afraid to take the lead at center stage. Though his voice has changed from back when he sang his solo of “Go Tell It on the Mountain,” Raymond still maintains the same kind of optimism and energy from when he was eight years old. Every day, he is aiming to improve himself to help support his team. And when his number is called, he is prepared and won’t hesitate to let his talents shine and let his song be heard.